Due to its controlled oscillations, Sirona’s prophylaxis professional will cause your patients virtually no pain. It is gentle on the gums and tooth surface; in short: gentle, precise technology. Fear is caused by insecurity. The right counseling, however, creates trust. With PerioScan your patients will understand treatment procedures easily and quickly. PerioScan will inform you right during the treatment of the location of calculus – optically, and if desired, also via an acoustic signal. So that you can now see and hear what, so far, has only been detected by tactility. This means for you that diagnosis and treatment have never been as combined as now. PerioScan proves itself not only with its prophylaxis competence but also with a comprehensive treatment spectrum, such as filling therapy or retrograde root treatment. Best of all: Every Sirona tip is compatible with PerioScan! 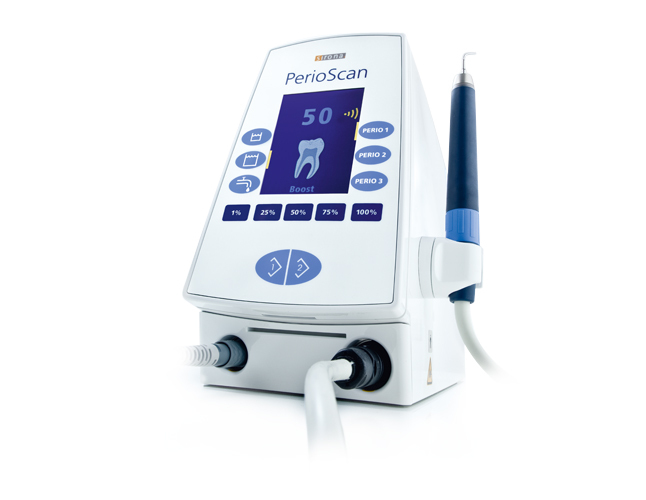 With its ergonomically shaped handpiece and the intuitively operated display, PerioScan can always be used precisely where you need it. Click the button below to add the Sirona PerioScan Dental Ultrasonic Scaler to your wish list.